These pages are devoted to a small boat that I've become quite interested in in recent years. Going by the unusual name Mave Rhoe this little yacht figured largely in both the personal history of the father of my friend Simon Watts (see The Art of Arthur Watts) and in the lives of a number of other yachtsmen at a particular period of English and European yachting history which happens to hold a great fascination for me. Consequently, I've decided to begin compiling all of the information I've come across into a consolidated whole which will undoubtedly expand as time goes by. Designed by George Frederick Flemmich, A.I.N.A. and built in 1903 by the Teignmouth Ship & Yacht Company, Mave Rhoe was about a 4-ton (2.65 registered tons) spoon-bow, counter-stern sloop. She was 26 feet long overall, 19 feet on the waterline and 6.6 feet wide. 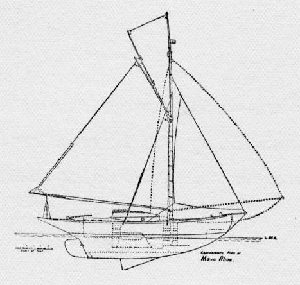 Under-canvassed (fortunately, according to one owner), sloop-rigged (with a gaff mainsail), with a center-board which, when in use, increased her draft from 3 feet to 6 feet. Her cabin was designed to sleep two but could accomodate four persons in a pinch. She was described by one as "bigger in her own estimation than her measurements would justify". In From the Thames to the Seine (1910 Chatton & Windus, London) Charles Pears includes the one lines drawing of Mave Rhoe that I know to exist. Was born in London in 1863, and educated at Harrow. He was a keen racing owner, starting with the Tom Thumb, 5 tons. He has since owned the Pixie (19 tons), Butterfly (22 tons), Tagus (21-ton steam yacht), Monica (37-ton auxiliary schooner), and the racing boats Cybele, Fraction, Unit, and Mahatma. In his early days he gained great experience in dinghy sailing. The Fraction, Unit and Mahatma were designed by their owner, and the 1-raters were built by Sibbick. Mr. Flemmich joined the Yacht Racing Association in 1892, and was elected to its Council in 1894, and he has taken an active part in the work of its technical committees. Clubs : Royal Thames, Royal Harwich. Residence : St. Mary's Lodge, Trimley, near Ipswich. Lloyd's Register of Yachts for 1903-04 notes that Mave Rhoe was built at Teignmouth by the Teignmouth Ship & Yacht Co. Ltd to Mr. Flemmich's design. She was initially owned by Capt. F.S. Atkinson, A.S.C., and was based in Harwich. The Lloyd's Register for 1906-07 apparently shows much the same information though by this time she was based out of Teignmouth. By 1907 she had acquired the official number 109682 which Mr. Pawlyn tells me implies that Mave Rhoe was cruising offshore or "going foreign" (in the later words of Arthur Watts). The author is reminded of a rather gruesome incident connected with the [Bill of Portland] race. He [Pears] had just brought up single-handed in Harwich near a fisherman. Presently a boat put off and a voice hailed, "Is that li'l boat named Mave Rhoe, sir?" Then satisfied upon the point the story began. It seems that the paid hand of a former owner with his son, a little boy of 9, having come from Teignmouth, got the yacht into the race off the Bill; the man was swept overboard and the boy crying with fright let the boat drift on. Ultimately as she drifted past Yarmouth, up the Solent, some men in a boat seeing something was wrong, went alongside. The boy told his story and the men gathered in the mainsheet. Entangled with this was the body of the boy's father which had been dragged all the way. Pears wrote of his purchase of the boat in Bringing Home the Mave Rhoe (1908, The Yachting & Boating Monthly). He therein describes part of the journey bringing Mave Rhoe out of Aldeburgh as far as Harwich in an overnight adventure with a somewhat portly companion described only as "Live Ballast". The accompanying illustrations provided by Pears show a boat that exactly matches the photograph at the head of this page. From this we can deduce that Pears was either the second or third owner of the boat. Unless such boats changed hands fairly often faster than the Lloyd's registry could keep up—it may be safe to guess that he was the second owner—the first being Capt. Atkinson who hired the ill-fated paid hand to bring her 'round from Teignmouth, a trip Mave Rhoe appears to have made a number of times. Assuming this order of ownership succession it must have been Atkinson who eventually had her laid up in saltings in Aldeburgh in 1906 as described by Pears. As noted earlier, Mave Rhoe had acquired the number 109682 by 1907. Perhaps at the hands of Capt. Atkinson or maybe driven by Pears who clearly intended to take her 'cross Channel. The years 1909 and 1910 were busy ones for Mave Rhoe. 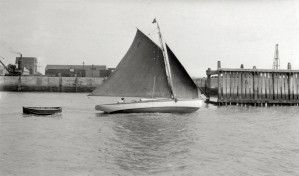 As previously mentioned, she figures prominently in Pears' From the Thames to the Seine in which he describes his 1909 summer adventure sailing down the Thames (from Hole Haven) to Ramsgate, across the Channel to France, along the coast to the Seine and Fécamp, and then back again. Hole Haven was quite a popular starting point for Pears and many others. It was notable enough to Pears that he painted it a number of times. In 1910 he wrote an article, The Saga of a Small Yacht Cruise (July 30, 1910 Supplement to the Graphic) in which he describes a three day cruise starting again from Hole Haven and sailing down the Thames, 'round to Dover, and across to Boulogne and back with a friend—again a novice sailor but this time with seemingly a bit more experience. Maybe the same fellow from the 1908 article? Mave Rhoe is not mentioned by name but the accompanying artwork is unmistakeable (and would be re-used by Pears in his 1931 book). It appears that sometime shortly thereafter, perhaps as early as 1910—probably by 1912 at the latest, Mave Rhoe passed to her next owner whom I believe to have been the novice friend of the earlier cruises—Arthur Watts. As we shall later see Watts' writes of experiences in Mave Rhoe that indicate that 1) he acquired her at about this time; and 2) he had some experience in sailing aboard her (which would imply experience prior to his ownership). We also know that Watts was not a small man. "Live Ballast" might have been an apropos description of him as a tyro sailor. It's also clear that by about 1912 Watts was learning to be a competent sailor in his own right. 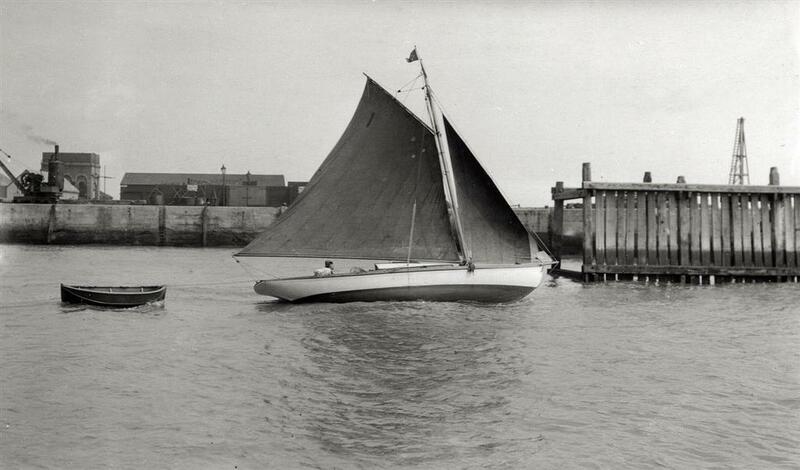 It seems that Watts initially sailed out of Harwich and then later moved his home port to Burnham-on-Crouch. It chanced that one day I was standing by the lock-gates looking out towards the Veeregat, when I saw a little sloop approaching which seemed somehow curiously familiar. Never before had I seen her, yet my memory told me we were not strangers. She was manned by a couple of amateurs whom, from their dress, I took to be English, until I noticed their Dutch caps. Still puzzling in my mind, I heard her skipper order his mate to lower sail as they ran into the lock. They were English sure enough, and the craft also. And when they came finally to moor astern of Jamaie and ourselves the British fleet at Veere was now raised to three. "Where are you from, sir?" "That sailed last year from Hammersmith to Havre and back?" "I took you for a couple of Dutchmen." "Oh, the caps; these, too, came from Dordrecht. We've had a fine sail." It was rather strange that the last book I had read before leaving England, that was actually now resting on my shelf in the cabin, was From the Thames to the Seine, in which Mr. Charles Pears described so interestingly his adventurous cruise in this Mave Rhoe single-handed along the French coast to Fécamp and beyond. And here by a curious coincidence she had arrived during our sojourn in this out-of-the-way port. The pictures in the book were still fresh to my mind, and that was why she seemed so familiar. But she had changed ownership since her French trip, and this time had come across the North Sea from Harwich, and was now bound down coast to Ramsgate. As she lay next to Vivette we had an interesting study in comparisons. If figures stand for anything, she has many similarities to Vivette. Mave Rhoe has a foot more in length over all, but Vivette has a foot more beam. But after this the similarity begins to disappear. Our ship is cutter-rigged, while she is a sloop. The Mave Rhoe has a centre-board, which, when lowered, draws six feet. In spite of our length and beam being so similar, there is far more internal accomodation in Vivette and more freeboard. Vivette, if I may say so, is more of a ship, with better qualities for keeping the sea in bad weather, and nothing would ever persuade me to go cruising outside land-locked waters with a centre-board. And as I looked on our new neighbour I began to marvel even still more at Mr. Pears' daring and to admire his skill in having brought her safe home again through the trying experiences he so well relates. "The first time Mave-Rhoe made the passage we crossed straight from Harwich to Flushing, but I believe that to be a bad plan, and for this reason: In so small a boat one must have fair weather. And with fair weather it is five chances to one that the breeze, probably none too strong in the day, will fail altogether at night, and leave one rolling and wallowing about, heartily sick of the whole business." We sailed to Zerixee the next day, taking the last of the ebb out of the Veergat, rounding the Onrust Sand, and catching the young flood up the Roompot. This Onrust Sand, by the way, is a dangerous one, gravel for the most part (three years ago Mave Rhoe found that out to her cost), and it is suicidal to attempt to sneak inside any of the buoys that mark it. Incidentally, I believe Arthur Watts had become quite an accomplished sailor by the date of the Yachting Monthly articles. In his From the Thames to the Netherlands (1914 Chatto & Windus, London) Pears includes a dedication to "Those right good men of the sea—Rhodes, Tonge, Park and Watts" and of course Watts (and many other young men of similar background and sailing experience) was gladly accepted into the R.N.V.R. at the outbreak of World War I where his intimate knowledge of the continental coast proved invaluable for the Dover Patrol (see The Movies for information regarding the Motor Launches of the Auxiliary Patrol often commanded by these young men of the R.N.V.R.—including Watts). Unfortunately, with the advent of the war, Mave Rhoe drops from sight—at least insofar as the documentation I have to hand would indicate. It seems likely that she survived the war laid up somewhere. It also seems likely that Arthur Watts sold her either before or after the war since there is no further mention of her within the family and he eventually turned to smaller boats (see The New Summer Haze). As I acquire or browse further old issues of The Yachting Monthly I hope to find more references and stories about Mave Rhoe, Arthur Watts, Charles Pears, Chatterton, Donald and Gordon Maxwell, Arthur Bennett (coincidentally a friend of Watts' future mother-in-law C.A. Dawson-Scott, founder of International P.E.N.) and that little world of artist-sailors that seemed to thrive between 1900 and 1914.